After Maligne Lake, this is one of Jasper National Park’s most treasured landmarks. Come for the spectacular walks or the surprising collection of art. Maligne Canyon is easy to get to from Jasper and it is popular because of its wilderness appeal. Because of the softness of the rock, the canyon is both steep and smooth-looking and it is a picturesque sight. The canyon is a result of the Maligne River “eating away” at the limestone valley it cuts through on its way from picture-perfect Maligne Lake to Medicine Lake lower down. Sometimes the water never gets there, adding to the mystery of the place. There’s no need for a guide at Maligne Canyon, the trail is clearly marked and paved. As you walk along the top of the canyon, you’ll notice it becomes deeper. In places, trees can be seen teetering on the canyon’s edge as it continues to be eroded. The water at this point passes through so many caves and tunnels that it is nearly impossible to keep track of. In fall the water stops flowing into Lake Medicine, which has puzzled people for centuries. Further down, the trail takes you to a succession of bridges spanning the river. Each of these provides a great spot to watch the water flow by far below. At the third bridge, take photos of waterfalls and the steep canyon below you. Most tourists turn back here, but it is definitely worth your while continuing until the end. The natural beauty on the way is even more pristine than in the first section of the trail. If you can’t walk that far, drive to the fifth, and final, bridge along the Maligne Road. If you wish to take home a souvenir, visit the gift shop. You can buy anything from cheap souvenirs to artwork worth many thousands of dollars. Maligne Canyon is located in Jasper National Park near the town of Jasper. In winter the facilities close. Have a look at our Jasper things to do page to learn about more activities in the area. This immense expanse of ice is home to six major glaciers, as well as some of the Canadian Rockies’ highest peak, including the mighty Athabasca Glacier. Explore the rugged beauty of Canada’s mountainous World Heritage Site on this spectacular journey through the heart of the Rockies. Take in the pristine beauty and powerful roar of one of the most photogenic waterfalls in Canada. This peaceful area is well within walking distance of Jasper. It offers isolated accommodation for those who want to be in the heart of Alberta’s natural beauty. As rugged, rocky beauty goes, this is one of the Canadian Rockies’ finest examples. Don’t miss the Angel Glacier at its foot, another geological marvel. Escape the crowds and enjoy a relaxed atmosphere at this laid-back resort in the Canadian Rockies. Its sky-blue waters, glacial mountains, and Spirit Island make this one of the Canadian Rockies’ most iconic locations for a fishing or boat trip. This lake depends on melted glacier water to fill up and it changes drastically with each season. Its disappearing water has amazed people for thousands of years. Visit one of the most impressive waterfalls in the Canadian Rockies. Moose and grizzly bears roam the area, so be prepared for amazing wildlife encounters! As one of the easiest cascades to get to in Jasper National Park and as one of the more photogenic sights, this is a popular stop along the Icefields Parkway. Cycle along nature paths and marvel at the diverse wildlife and thick forest that surrounds this tranquil lake in the Jasper National Park. This quaint mountain town is the perfect base for outdoor activities and a peaceful place to stay while visiting the Canadian Rocky Mountains. Ride this sightseeing tram up Whistler’s Mountain and marvel at a panorama of peaks that includes Mount Robson, the highest point in the Canadian Rockies. 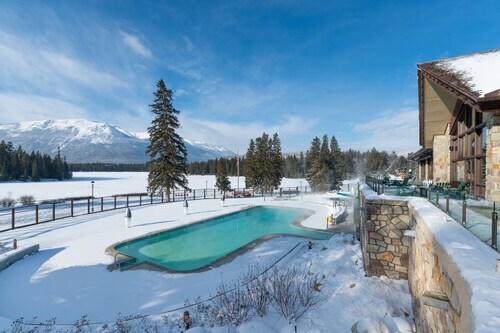 Conveniently located near the ski slopes, this Jasper resort is within 1 mi (2 km) of Jasper National Park, Icefields Parkway, and Fairmont Jasper Park Lodge Golf Course. Maligne Lake is 2.8 mi (4.5 km) away. Situated in a national park, this hotel is steps from Icefields Parkway and Jasper National Park. Patricia Lake and Maligne Lake are also within 6 mi (10 km). Jasper Station is 13 minutes by foot. 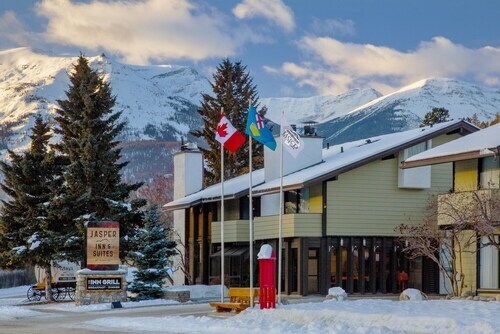 Located near the slopes, this Jasper hotel is in the mountains and within 1 mi (2 km) of Jasper National Park, Icefields Parkway, and Jasper Activity Centre. Jasper-Yellowhead Museum and Archives and Jasper Municipal Library are also within 15 minutes. Jasper Station is 14 minutes by foot. 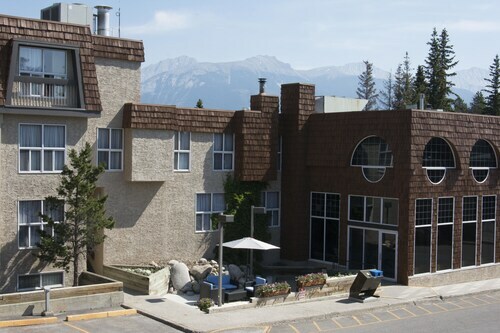 Situated in Jasper, this spa hotel is steps from Jasper National Park and Icefields Parkway. Jasper Activity Centre and Jasper-Yellowhead Museum and Archives are also within 15 minutes. Jasper Station is 15 minutes by foot. Located near the slopes, this Jasper hotel is in the mountains, within 1 mi (2 km) of Jasper National Park and Icefields Parkway, and close to winter sports such as cross-country skiing and snowshoeing. Maligne Lake is 3.1 mi (4.9 km) away. Jasper Station is 18 minutes by foot. 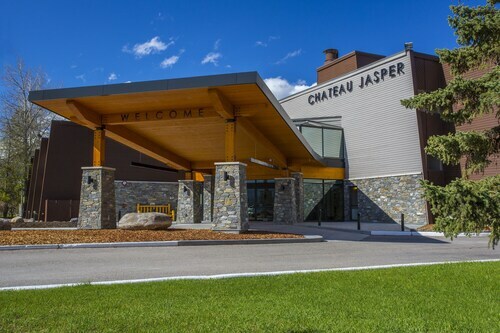 Located near the slopes, this Jasper hotel is within 1 mi (2 km) of Jasper National Park and Icefields Parkway and close to winter sports such as cross-country skiing and snowshoeing. Jasper Activity Centre and Jasper-Yellowhead Museum and Archives are also within 15 minutes. Jasper Station is 15 minutes by foot. Marmot Lodge, nestled in the heart of Jasper National Park, is 2.5 miles from Lake Annette, and 3 miles from both Lac Beauvert and Lake Edith. Situated on a lake, this eco-friendly hotel is steps from Jasper National Park and Icefields Parkway. Patricia Lake and Pyramid Lake are also within 1 mi (2 km).